Alais is elven and comes from a very old family that has been rooted in Nitesong as the reigning family for over 2300 years. At this time, Alais is the heir to the Nitesong provinces, but she has turned over the daily requirements to her twins. These twins are the only children Alais has, and her Lifemate has been lost years ago. She still wears the starfire and infinity ring from their bonding. The glow is faint, but still present from Ulysses homeworld. 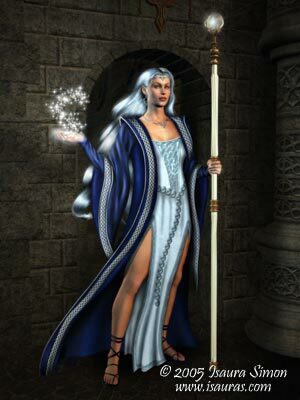 As a widow, Alais sought the training and counsel of the Archmage Morrin from Annara. Morrin had left his home of Annara and settled in Riverbend. He very reluctantly took Alais in, and taught her many of his secrets, dark though they were. Alais innate skills were in summoning, but after spending decades in study with Archmage Morrin, she developed and accommodated the Necromantic arts. Her time in Riverbend forever added a shadow to Alais. Much of Alais’ spell casting is done in Annaran, and carries the dark side of necromancy. It is fairly infrequent that you will hear spell casting in Elven from her. Now, with Morrin departed from Riverbend, Alais has become mistress over the Annaran Archmage’s home. It is to Riverbend she retreats when she requires time away from the living. Here, only ghosts and shadows linger. Alais keeps a house in RhyDin proper. It is called I’ Taurn, and was part of the Nitesong legacy. It is a large, 4 story home of white ashlar that has been modified heavily when Ulysses was alive and the two were in residence together. Now, the house is nearly empty, with only minimal staff to assure privacy and no vandalism to the property. When Alais is in RhyDin, she will be found here, or in the Arena. The house is capable of entertaining on a large scale, but is seldom called upon for those functions by the widowed sorceress. She does however spend hours walking the grounds of I’ Taurn House amid the gardens and trees. A shadow among the vegetation.